Dundee’s Betfred Cup run ended in miserable style with a 3-0 home defeat in the last 16 tie against Ayr United. The visitors from the Championship were well worth their win, with two goals from Lawrence Shankland and one from Michael Moffat. Dundee made their task much harder when Sofien Moussa was sent off after coming on as a substitute. To cap a bad afternoon for the Dee Genseric Kusunga was given a straight red card in injury time. The Dark Blues made two changes from last week. Adil Nabi and Craig Wighton both started, replacing Sofien Moussa, who was on the bench, and Paul McGowan. 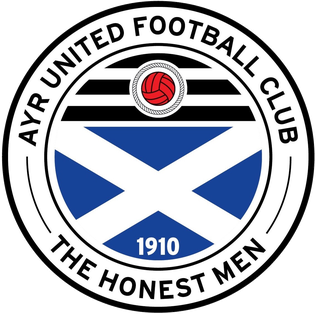 Ayr were unchanged from the last league game after fielding a less experience line-up in their midweek Irn Bru cup tie. Ayr started the livelier side and had the edge throughout an open first half. The visitors had the first sniff of goal when Jack Hamilton collided with one of his own defenders as they both went for a cross. Dundee managed to scramble the ball away for a corner. That wasn’t defended well and Shankland found space for a shot at the far post that Hamilton blocked. Ayr kept up the pressure and from another corner Lawrence Shankland’s fierce angled volley took a deflection and zipped past the post. Shankland soon had another effort when he fired into the side netting from a very difficult angle after sneaking in behind Josh Meekings. Dundee’s first shot on target was by Craig Wighton from 15 yards. Jean Alassane Mendy set up him up, but Wighton didn’t get enough power into his shot and Doohan was able to get across to save. Adil Nabi went close with a dangerous curling shot from the edge of the penalty area that missed the far post by inches. After a scrappy spell in which the defences seemed to be taking a cautious approach Genseric Kusunga was caught out by Shankland wide on the left. The Ayr striker robbed the Dee centre back and teed up Andy Murdoch, who seemed odds on to score. His shot was the opposite of Wighton’s earlier effort, all power but too close to Jack Hamilton who managed to tip the ball over the bar. From the corner Dundee broke and Ross Doohan had to save well from Mendy, turning the ball round the post. Benjamin Källman came on for his debut at the start of the second half, replacing Craig Wighton. The Dee were quickly on the attack and Doohan had to save at his near post from Jesse Curran. Any hope that offered the home support was quickly snuffed out as the Dee fell out of the match. After 51 minutes the Dundee defence failed to deal with a simple long ball through the middle. SHANKLAND pounced on the chance, finishing clinically from 15 yards, giving Hamilton no chance. At home to a Championship side this is when a Premiership club should have pulled themselves together and put the visitors under serious pressure. That simply didn’t happen. Dundee couldn’t settle in possession or put worthwhile balls into the penalty area. Ayr grafted their way through this spell dealing competently with whatever Dundee threw at them and looking dangerous on the break. Sofien Moussa replaced Mendy just after the hour and his game lasted only 15 minutes. He was booked for a clumsy aerial challenge on Andy Geggan, and after testing the referee’s patience with a further reckless foul he repeated his yellow card offence with a foul on Mark Kerr. The red card from referee John Beaton was utterly predictable. To their credit Ayr responded to Moussa’s departure by taking control and pushing for a killer second goal rather than sitting back against 10 men. Robbie Crawford should have made the game safe after good work on the right by Andy Murdoch but his shot flew a couple of feet over the bar. Lawrence Shankland went closer with a six yard header that crashed against the crossbar. He didn’t have long to wait for his second goal. After 86 minutes SHANKLAND bundled the ball past Hamilton after Daniel Harvie served up an excellent low cross into the goalmouth. Three minutes later Michael MOFFAT scored an identical goal prodding Crawford’s cross from the right into the net with Dundee’s defence in disarray. 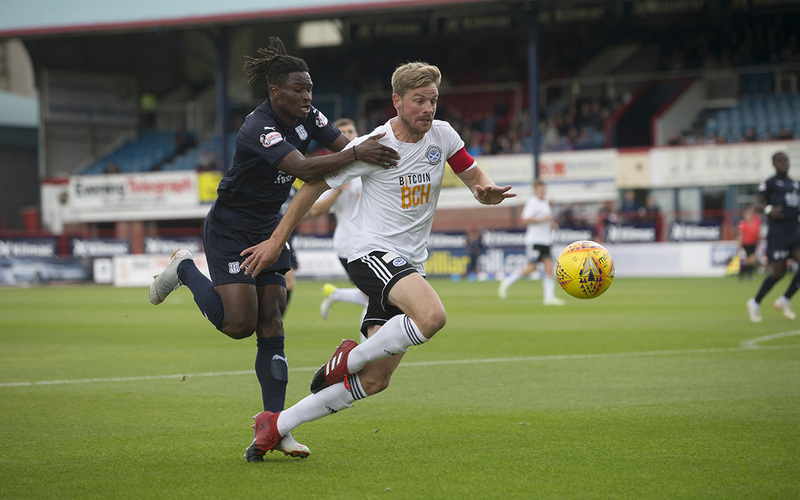 A dreadful afternoon for the Dee, and the defence in particular, was completed in injury time when Genseric Kusunga lunged at Moffat and was sent off. Dundee were nowhere near pass marks in any part of the team today. When play was scrappy Ayr were invariably first onto the loose balls. When the game opened up the visitors were always more confident and fluent. It was a tough afternoon for Benjamin Källman to make his debut. The service he received was always poor. He worked hard, but to little effect and with no support, especially after Moussa was sent off. 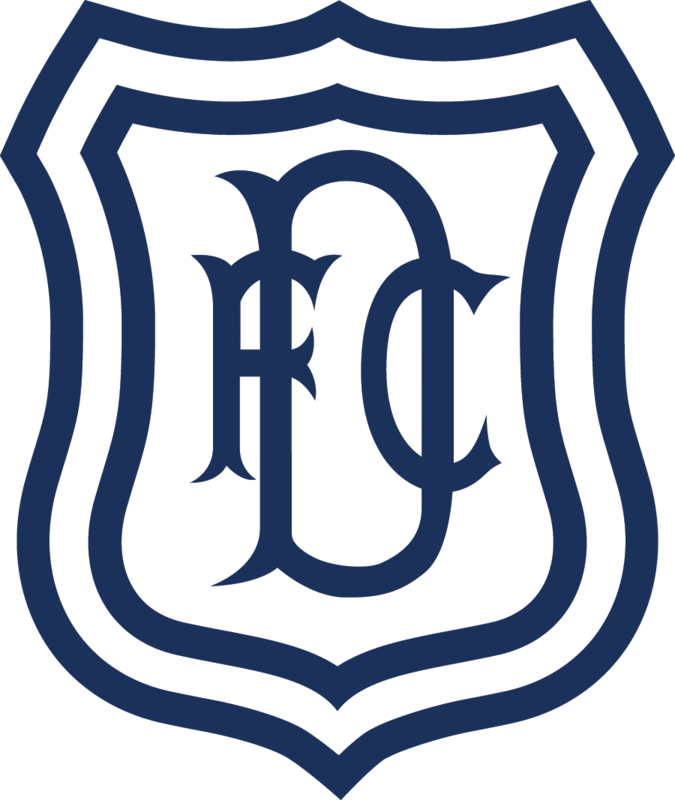 Dark Blues fans are desperate for a good cup run, but at no stage of today’s match did it look as if the Dee were likely to stay in the Betfred Cup. They were second best throughout against a very good Ayr team who are obviously brimming with confidence. Wighton (Källman at half time), Mendy (Moussa 62). Unused subs: Parish (gk), Kerr, Caulker, Lambert. Booked: Moussa (foul on Geggan), Moussa (foul on Kerr), Ngwatala (dissent). Sent off: Moussa (two bookings), Kusunga (foul on Moffat). Unused subs: Hare-Reid (gk), McGuffie, Ferguson, Bell, Smith. Goals: Shankland (51, 86), Moffat (89). Attendance: 3,151 (445 Ayr fans). Referee: John Beaton. Assistants: Drew Kirkland, Paul O’Neill. Fourth Official Barry Cook.